Orion works digging in the treacherous mines of Outpost Five. They are mining for cirium, which is the only thing that protects humans from the radiation poisoning due to the flash curtain that has sent most humans under the protection of the cirium protected city. If Orion and her partner, Dram, can mine 400 grams of cirium they will earn their freedom into the protected city, but so far no one has ever lived long enough to do that. Orion is special in that she can hear the cirium calling to her and she ends up finding a huge deposit that she knows will ensure her freedom, but there are forces trying to keep her from succeeding. Then, newcomers come to Outpost Five and many of the things they tell Orion make her question everything she has ever known. Who can she really trust and who, in fact, is out to make sure she fails in everything she tries? Fans of Red Rising will like this title because it has an unusual setting and plenty of action. The author does not shy away from killing off characters so it’s hard to predict who will live and who will die. The struggles of Outpost Five are terrible and neverending, but without Orion none of the Outpost community would stand a chance at survival. There are many surprise twists in the plot as they try to find out what the government is really up to and how they can go about changing the terrible fate they have been dealt. Readers who want action/survival should definitely check this series out. Rory is thrilled when she gets accepted into the prestigious Theden Academy, an all expense paid prep school with an excellent reputation. Shortly before she leaves, she learns that her mother, who died in childbirth, also attended Theden and left her a symbolic necklace. This story is set in the future where everyone is dependent on their smart phones and uses an app called Lux that makes literally every decision for them from what to major in to what to eat for breakfast. As Rory settles in she meets a young barista at a nearby coffee shop and he helps her see what a disadvantage it is to always have an app make decisions for you. She begins using Lux less and less and in the process notices more around her, including the shady practices of her new school. Is someone out to get her? What really happened to her mother and did she actually die during childbirth? This is a fun, fast paced story that fans of futuristic fiction will enjoy. The story is detailed and has many revelations that unfold in a timely way. The characters are all well developed and it’s easy for the reader to see each of their motivations. Despite there being quite a market for futuristic dystopian-esque books this one is unique enough to stand out and will keep readers engaged. Avalon wakes up in her cryochamber and learns that she has been frozen for 100 years. She also remembers that when her father predicted that a meteor would strike earth, and completely decimate life as they knew it, only 5000 people were allowed into the underground habitat that was created to sustain life until humans could return to the surface again. Since such a limited number of people were allowed into the habitat only younger people were allowed and Avalon was forced to say goodbye to her beloved father. Upon reawakening, Avalon notices some strange happenings in the habitat including that some people seem to be getting deathly ill when they are supposed to be immune from such diseases due to a vaccine everyone receives once they come out of the cryochamber. Who could be behind this? Whom can she trust in this new place surrounded by people she does not know? Should she speak up and ask questions or simply take the safer route and follow the rules? Fans of futuristic novels such as The Testing, Alive, Across the Universe, or Red Rising will enjoy this title. The plot moves quickly and the characters are interesting and engaging. There is some resolution, but the ending definitely leaves room for a sequel. While some aspects in the story can be found in other similar titles, there is enough originality here to draw readers in and make them want to know what’s going on in this strange habitat controlled by a few people. Recommended. 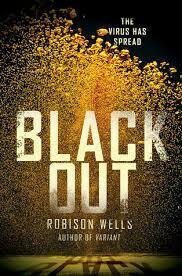 This futuristic novel depicts the U.S. suffering from multiple terrorist attacks at the hands of U.S. teenagers. The army begins gathering up all teens to have them tested for a particular virus they believe is causing special powers in these young adults. Every teen seems to manifest different powers, but they are all extraordinary such as manipulating minds and turning invisible. Alec and Laura belong to one of the terrorist groups trying to destroy national landmarks and industrial buildings. Meanwhile, Aubrey and Jack are merely two teens at a high school dance when they are apprehended and tested for the virus. Aubrey knows she has a special power, but Jack is shocked to learn he tested positive for the virus. Through exciting circumstances all of these characters will come into contact with each other and try to survive this deadly situation. Unfortunately, some want to make the chaos and destruction stop while others want to be the cause. Fans of futuristic novels such as Divergent will enjoy this title. There’s even a super hero feel to this as the teens learn of their different and amazing abilities. The story moves at a steady pace and the characters are portrayed in a way that really lets the reader know who they are and what they want. However, there are a lot of unanswered questions and unexplained potential that most definitely will be used in future books so readers need to be prepared to end this book with a lot of questions. All young adults will enjoy the title, but boys and reluctant readers will especially enjoy it. Cia Vale lives in a very small farming community on the outskirts of their civilization. The civilization was once ravaged by the Seven Stages War and everyone left behind is simply trying to survive. Every year when the local school graduates a class of students everyone secretly hopes that someone from the government will arrive to invite someone to the Testing. 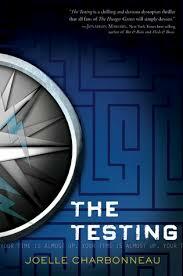 The Testing is a super secret test that only the best and brightest are invited to. No one really knows what it entails, but if you do well you get to go on to higher education. Cia’s father underwent the testing in his youth and is a very accomplished scientist, but he does not remember much about the test and seems leery of wanting his children to have this same great opportunity. No one from Cia’s community has been chosen for years, which is why it’s so surprising when four are invited, including Cia. As Cia begins her journey she is warned to trust no one. What has she gotten herself in to? Will she ever return from the Testing? This book is definitely similar to The Hunger Games and Divergent, but for readers who enjoy that type of novel it is still very engaging. Despite some of the similarities to other stories out right now many readers will care about the characters in this book and wonder what will happen to them through the course of this testing. The book does have a fair amount of violence, betrayal, and overall treachery so readers who prefer lighter novels should keep looking. Recommended for reluctant readers. In this futuristic story, Day is a rebel who hides in the shadows and pulls pranks on authorities. He is the number one wanted criminal. June is a girl living in the Republic whose brother is a soldier for a high ranking official. She is considered a prodigy because she is the first and only person to earn a perfect score on the training test given to every ten-year-old in the Republic. After an attempt to obtain medicine from a hospital leaves June’s brother murdered she is led to believe Day was the culprit responsible. June goes undercover to find and apprehend the biggest criminal standing in the way of the Republic’s goals so she can avenge her brother. Day ends up being much more than she bargained for, however, and she finds the more questions she answers the more that arise. Whom can she trust in this government? Can she believe anything she was told over her entire childhood? This exciting story will interest readers who like books such as The Maze Runner and The Hunger Games. 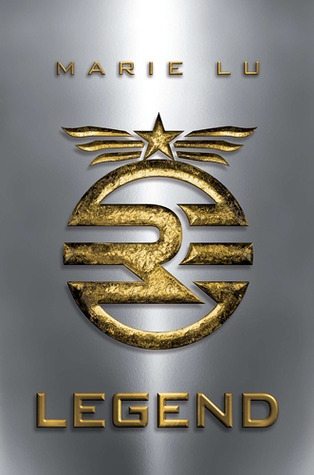 The setting is reminiscent of Divergent, but focuses much more on the goals of the Republic and not the little sectors that make up the people. The chapters alternate between Day and June so that you see each of the sides of this battle and why they see each other as the enemy. Many secrets unravel quickly, but it’s obvious there are many more where that came from. There is currently one sequel out and there will probably be more. 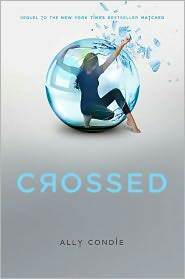 In this sequel to Matched Cassia is trying to find Ky by getting herself sent to the outer provinces as an abberation. Of course, she is an actual citizen, but is willing to jeopardize her citizenship status for true love. Ky has been fighting the attack on the Society for some time and has seen many people die around him. One day he decides to run for his freedom and takes two friends with him. Cassia arrives at the outer provinces to discover that Ky is gone or possibly dead, but she never loses hope. Instead, she tries to follow where she believes he might have gone in the hopes of finding him and the rebel organization fighting the Society. The journey is very difficult and some of the lies she was told by the Society threaten her life out in the wild. Can Ky and Cassie find each other against all odds? If they do find each other will they be able to rekindle the spark they once had or will their future goals pull them apart? This installment of the story moves very slow and leaves many questions unanswered, which could frustrate the readers. Cassia does learn a few things about Ky’s past and the truth surrounding the attack on the Society that they do not want citizens to know about. However, there are still many things left unmentioned and favorite characters either don’t appear at all or only for short instances. The ending was intriguing, but ambiguous and after the long journey it took to get there readers should expect more. Hopefully readers will be intrigued enough by Cassia’s overall journey to keep reading after this, but the lack of answers in this book might make them question how forthcoming the third book will be with answers.